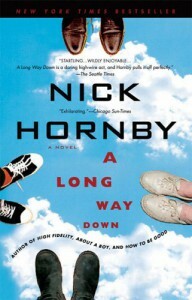 Long Way Down is an odd book, but as is typical of Hornby's work, it's engrossing and brilliantly written. It begins on the roof of a building, where four people - intent on committing suicide by throwing themselves off - have run into each other. Rather than jump (which would make for a short novel), the group agrees to meet on Valentine's Day, setting the stage for what's to come. Each chapter is written from the perspective of one of the four, and while the effect can be dizzying at times, it's also handled cleanly enough that it becomes engrossing. Hornby's characters are richly drawn and detailed, and I found myself as drawn to the writing as I was the characters. Hornby fans will love this, plain and simple.